We concentrate on appropriate algorithmic processing of microwave Ground Penetrating Radar (GPR) data obtained from concrete specimens containing tendon ducts below steel reinforcement bars either via simulations or via experiments. The goal is to understand the physical phenomena of electromagnetic wave propagation and scattering in detail in order to optimize imaging algorithms like SAFT (Synthetic Aperture Focusing Technique as the NDT version of SAR) in its 3D diffraction tomographic FT-SAFT formulation (Fourier-Transform-SAFT). Therefore we start with the simulation of a "simple" specimen and switch to a more realistic one in order to check whether simulation and experiment can give comparable results. Basically, this could be confirmed, but, nevertheless, various parametric studies will still have to be performed in the future. Fig 1: Idealized geometry of the BAM test specimen (2m x 1.5m x 0.5m), diameter of the rod: 85mm, depth: 100mm, mesh size of reinforcement grid: 180mm/170mm, depth: 30mm) together with the plane wave excitation impulse (-3dB cutoff frequency ~ 0.9GHz). 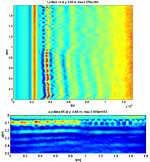 The Federal Institute for Materials Research and Testing (BAM: Bundesanstalt für Materialforschung und -prüfung) realized a concrete test specimen in particular for GPR purposes. Fig. 1 displays its somewhat idealized geometric features for the simulation: within a homogeneous concrete block of relative permittivity er and zero conductivity a metallic rod with circular cross-section as a model of a tendon duct is embedded, which is partly covered by crossed steel reinforcement bars. As a commercial simulation tool we use Microwave Studio , which is based on a consistent discretization of Maxwell's equations . For simplicity - we are interested in the fundamental physical phenomena! - we use an impulsive plane electromagnetic wave traveling in negative z-direction as GPR excitation within the concrete, i.e. there is no surface effect of the block. The chosen Gaussian impulse is also shown in Fig. 1. The linear polarization of the electric field strength is in x-direction, i.e. parallel to the tendon duct (TM polarization). Fig. 2 exhibits a series of wavefront snapshots in an yz-plane for x in the region of missing steel reinforcement grid. As expected, we observe the scattering of the plane wave at the circular cylindrical perfectly conducting steel rod (note: this is a 2D slice out of the 3D wavefield); boundary effects of the block are suppressed via absorbing boundary conditions, hence, there is no reflection of the scattered wave at the surface. Fig 2: Wavefront snapshots in an yz-plane for x = x1 in the region of missing reinforcement grid (x1 = 0.35m). 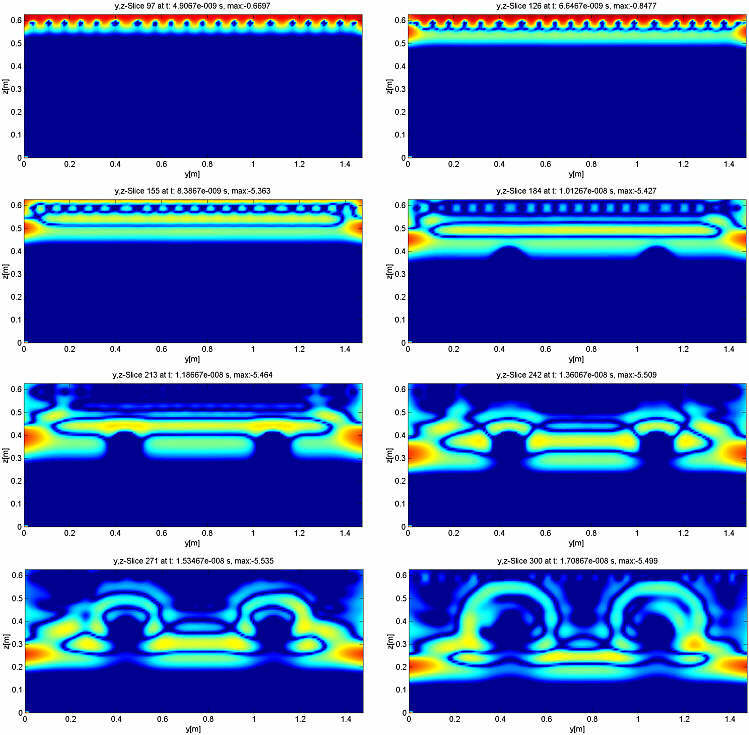 Fig 3: Wavefront snapshots in an yz-plane for x = x2 in the region with reinforcement grid (x2 = 1.5m). Fig 4: Comparison of simulated BAM B-scan data for the two 2D slices at positions x1 = 0.35m and x2 =1.5m. 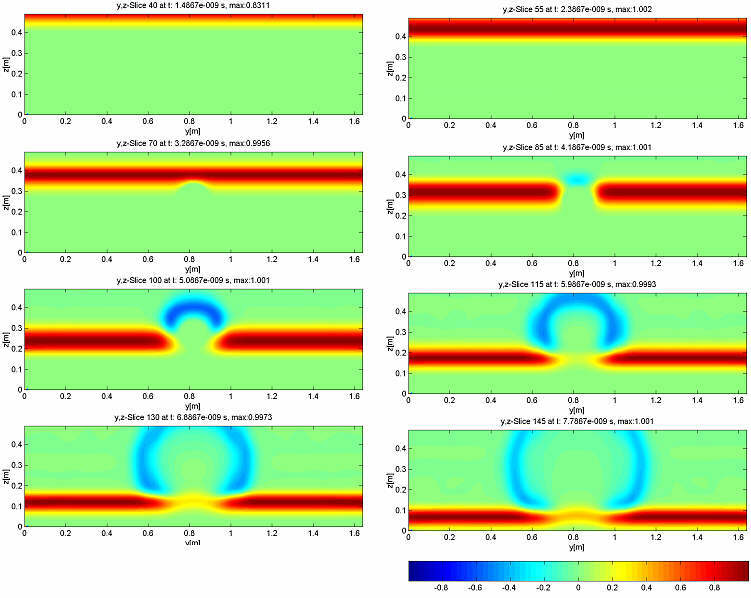 Fig 5: FT-SAFT processing of simulated BAM B-scan data: three orthogonal slices out of the 3D image are displayed together with an isosurface contour image (the image of the incident wave has been subtracted). In Fig. 3, an x-value has been chosen which is below the grid, and, obviously, wave propagation is much more complicated due to the "sifting"property"of the grid; nevertheless the sifted incident wave is still significantly scattered by the rod. This results in the simulated B-scan data of Fig. 4: the x-component of the electric field strength as a function of the scan coordinates x and y is recorded as function of time t on the surface of the block (with absorbing boundary conditions); two 2D slices referring to positions x1 and x2 out of the 3D data field are displayed. Obviously, the hyperbolic diffraction curve of the rod is clearly visible for both x-locations, even though somewhat faint below the grid; of course, the grid also shows up in the data. The horizontal "bar"is the incident plane wave, not the wave reflected by the surface. Finally, Fig. 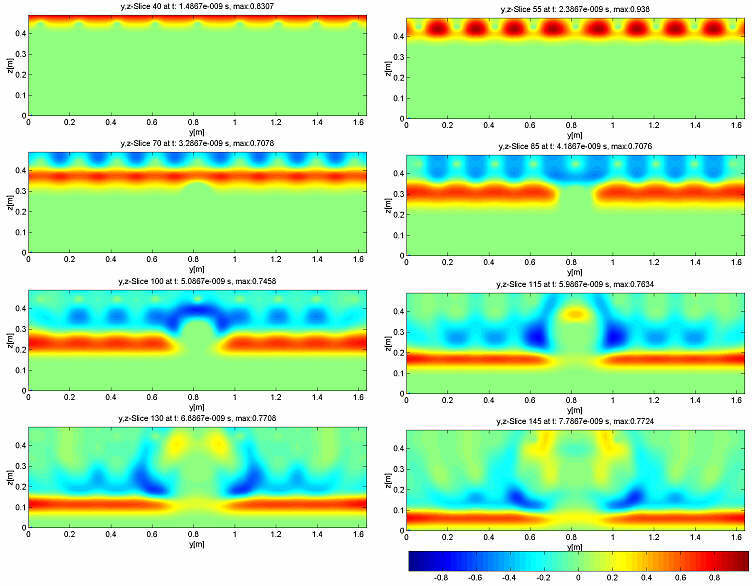 5 shows the result of 3D FT-SAFT processing [3, 4, 5, 6] of the simulated B-scan data for the BAM specimen: As anticipated from the B-scan data, the rod can be detected and quantitatively located below the grid. The Federal Highway Research Institute (BASt: Bundesanstalt für Straßenwesen) has realized another specimen whose idealized geometry is displayed in Fig. 6; in contrast to the BAM specimen it contains two tendon duct models, and both the top and the bottom are steel reinforced with the particular feature of a changing grid size. As before, we start with a look at the wave propagation in terms of movie snapshots: Fig. 7 confirms that, at least in the region below the grid with the larger size, the two rods lead to significant scattering of the incident wave sifted by the grid. Therefore, this physical observation should be reflected by the B-scan data, and indeed, in Fig. 8a we recognize the diffraction hyperbolas of the rods, even though corrupted by a lot of "ringing"due to multiple reflections. In contrast, in Fig. 8b - the incident wave is sifted by the smaller grid - the rods are shaded by the grid. Hence, FT-SAFT data processing (Fig. 9) has only been performed for that part of the 3D data, which belongs to the xy-area of the grid with the larger size. Two facts are worth being noted: the surfaces of the rods are correctly located, and the structure of grid parallel to the polarization of the electric field strength is resolved. 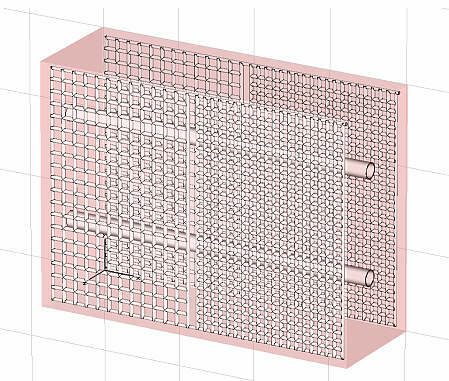 Fig 6: Idealized geometry of the BASt test specimen (2m x 1.5m x 0.7m), diameter of the rod: 100mm, depth: 250mm, mesh size of reinforcement grid: 75mm (left), 50mm (right), depth: 35mm). Fig 7: Wavefront snapshots in an yz-plane for x = x1 = 0.46m in the region with the larger grid size. Logarithmic scale: -40dB. Fig 8: Comparison of simulated BASt B-scan data for the two 2D slices at positions x1 = 0.46m and x2 = 1.54m; logarithmic Scale: -60dB. 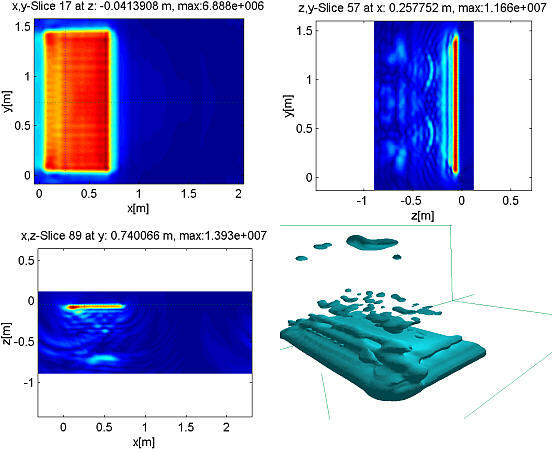 Fig 9: FT-SAFT processing of simulated BASt B-scan data: three orthogonal slices out of the 3D image corresponding to the grid with the larger size are displayed together with an isosurface contour image (the image of the incident wave has been subtracted). Finally, experimental B-scan data have been taken from the physical realization of the BASt specimen with a commercial GPR system. Since antennas can never radiate base band pulses like the one in Fig. 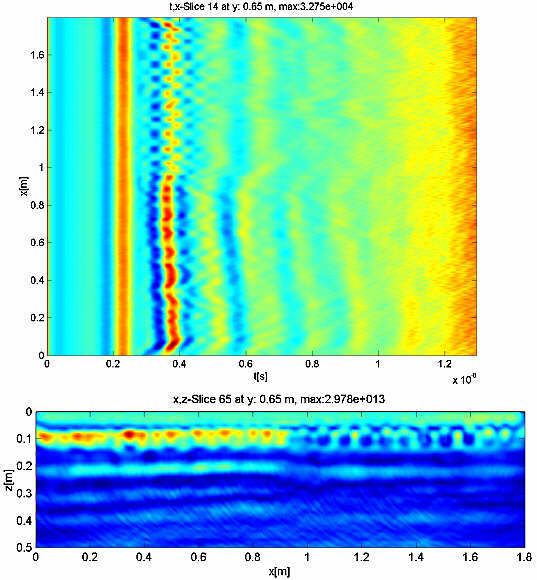 1, which was used for the simulations, the incident wave is "automatically"band-limited, and the pulse exhibits a well-defined center frequency, which, in the actual case, is approximately 1 GHz. A second difference with regard to the simulations is the following: In the simulations we postulated a single incoming plane wave from a fixed direction, and "receiver"locations varied along the specimen surface, which is called a bistatic set-up, whereas the experiment is a multi-monostatic set-up, and the incident field is the radiation field of an antenna and not a plane wave. Therefore, a complete coincidence between simulation and experiment cannot be expected. And in fact, Fig. 10 confirms that there are differences: the grid structure is resolved for both mesh sizes, yet the tendon ducts could not be located, not even below the larger mesh size. 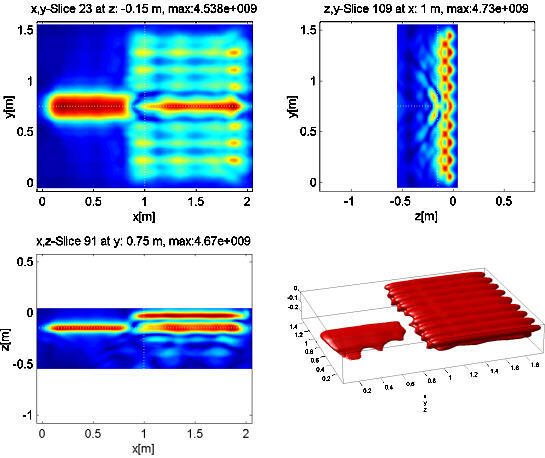 We could confirm that simulations are principally capable to reveal the physical phenomena of wave propagation in complex geometries explaining the actual information content to be expected in experimental data. Furthermore, the imaging algorithm FT-SAFT has been validated as a powerful tool for NDT of concrete.